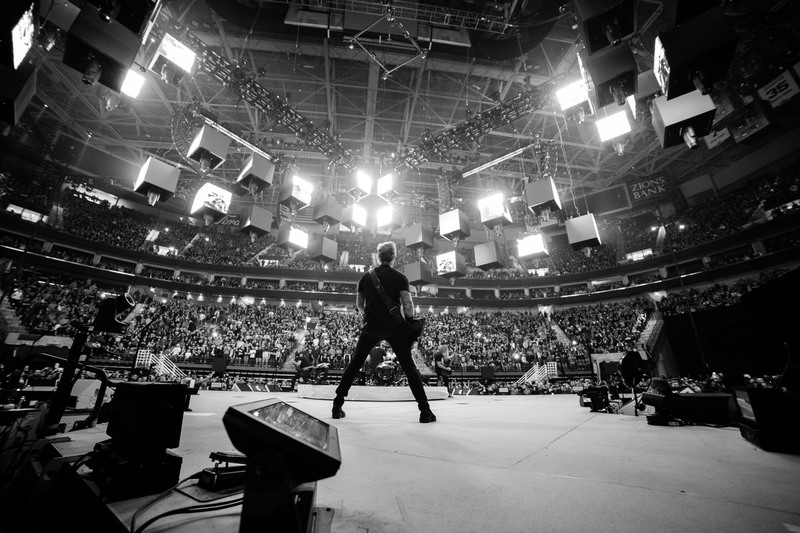 Friday, Nov. 30, marked the night Metallica brought their Worldwired Tour to the “salty city.” Typically, I’m not into going to big, flashy concerts, but when I heard that Metallica would be rolling through the Vivint Smart Home Arena, how could I refuse that? Not to mention, that I’ve been listening Metallica ever since I was running around in diapers and have a soft spot in my heart for them. When you hear James Hetfield’s iconic vocals, those intense, rumbling bass lines from Robert Trujillo, Lars Ulrich’s perfectly formulated fills and Kirk Hammett’s legendary guitar solos, it’s impossible not to get into it. Prior to the show, I was beyond excited. It was one of those shows that I counted down the days to. I think I talked about my excitement every single day leading up to it. So, when Friday night came, I couldn’t wait to get ready, drive into Salt Lake City and head bang until my neck hurt. Once we got to the arena, I got my wristband, grabbed a T-shirt (because it’s a Metallica concert, and I had to get one, even if it was $60) and found my seat. Jim Breuer took the stage first. Honestly, I had no idea who he was until someone reminded me that he starred in Half Baked, but once I finally brushed off my embarrassment from not recognizing him, I could comfortably laugh at his jokes and enjoy his efforts. I loved this twist. Having a stand-up comedian open for a legendary metal band seems a little unconventional at first, but I think it made for a diverse evening. I liked that Metallica was the main musical act and that I got a little taste of something different to kick off the evening. Breuer would return to the stage multiple times after his opening set, hyping the audience up for what was to come. He even lead a little heavy metal sing-along segment, where they played artists like Pantera, Ozzy Osbourne and AC/DC. I definitely participated, proudly. Once it was known that Metallica would be taking the stage shortly after Breuer’s last appearance, I felt like a little kid in a candy store. I couldn’t wait to actually see them onstage with my own eyes. It was one of those moments of anticipation where I couldn’t believe that I was in the same space as Metallica. They ran onto the stage, got themselves comfortable in their instruments and kicked off the show with “Hardwired,” of course. The first couple songs were off of Hardwired … to Self-Destruct, which was a high-energy introduction into their set. They followed with “Seek & Destroy” off of Kill ‘Em All, a song that definitely slaps in my book, especially live. What I really need to talk about are those special effects and visuals. The stage was surrounded by floating cubes, and on each side of the cube was a screen that displayed a variety of different visuals that matched the theme/vibe of each song. For example, when they played “Hardwired,” the screen displayed different variations of the album cover, with each of their faces morphing into each other. This was insanely entertaining, and I caught myself getting lost in them more than once throughout the evening. The visuals varied from fire, movie clips, falling crosses, biblical art and a handful of others. These cubes were a show in and of themselves. At one point during the show, when they played “Now That We’re Dead,” there was an extended drum solo where four of the cubes descended from the rafters and each member struck drums that rested on top. This was only one of the many interesting, unexpected moments in their performance. Next came “Creeping Death,” “For Whom the Bell Tolls” and “Halo on Fire.” Once the intro for “For Whom The Bell Tolls,” echoed through the speakers, I knew that this was the beginning of the face-shredding portion of their set. No doubt, after “Whiplash,” they played “Fuel,” and I lost my goddamn mind. They introduced the use of pyrotechnics to their show, and it was insanity. I know it’s “not cool” to love Reload, but If I only had gotten to see them play “Fuel,” I would have been just as stoked as seeing the entire performance. It was radical in every way. They rounded out their set with all of the favorites, featuring “Sad but True,” “One” and “Master of Puppets.” Their encore was short and sweet, showcasing “Fight Fire With Fire,” “Nothing Else Matters” and “Enter Sandman”—the moment everyone was waiting for, really. It was exciting to see that song live, and the energy of the room definitely reflected it. Fans young and old let loose completely, and there was a unifying sense of belonging that filled the arena. Overall, it was definitely a show that I’m glad I experienced in my lifetime. Seeing Metallica and all of their glory in my hometown was overwhelmingly fun. It was a thrill from start to finish, and I couldn’t have asked for a better experience. 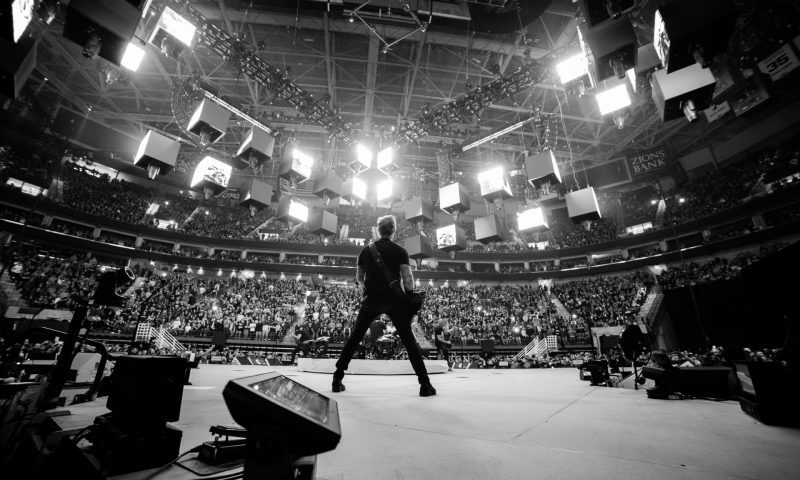 Once a member of the Metallica family, always a member.